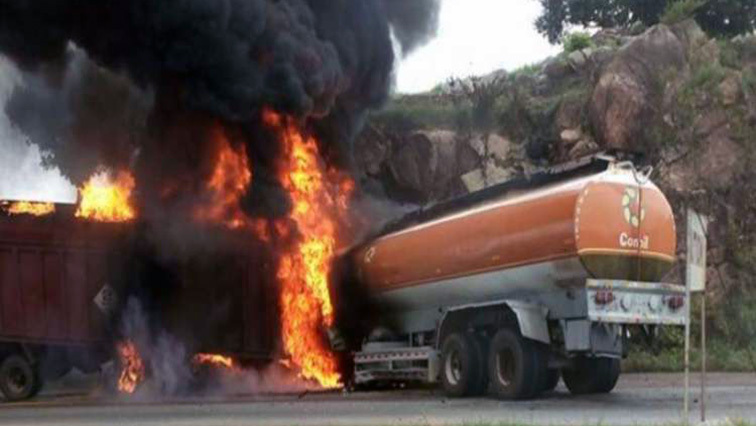 12 killed in fuel tanker explosion in Nigeria: police - SABC News - Breaking news, special reports, world, business, sport coverage of all South African current events. Africa's news leader. The driver lost control of the fuel tanker as he tried to avoid colliding with another truck at a bridge. Twelve people were killed and 16 others badly injured when a fuel tanker exploded in northern Nigerian city of Gombe, police told AFP on Sunday. The driver lost control of the fuel tanker as he tried to avoid colliding with another truck at a bridge on the outskirts of the city on Saturday. The tanker fell on its side, “spilled its contents and exploded, causing an inferno that engulfed other road users,” Gombe state police spokesperson Mary Mallum said. “Twelve people burned to death while 16 others were seriously injured and evacuated to hospital for treatment,” she said, accusing the driver — who was among those killed — of reckless driving and speeding. Accidents are common on Nigeria’s poorly maintained roads, many caused by reckless driving, speeding and disregard for traffic rules. Nineteen people were killed on April 5 when a truck crashed in northern Katsina state due to “fatigue and overloading”, according to road safety officials. This entry was posted on 14 Apr 2019,03:09PM at 3:09 PM and is filed under Africa, Homepage Featured Story Slider. You can follow any responses to this entry through the RSS 2.0 feed. Both comments and pings are currently closed.